Trojans wrestling coach Craig Rieger had an early Christmas present from his team as the team secured two conference wins before the holiday break. 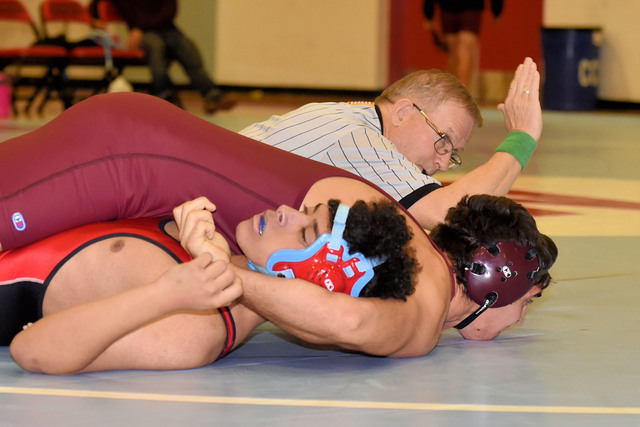 Pahrump (4-6 overall, 2-0 Sunset League) beat Sunrise Mountain 60-10, and Western 58-15 on Dec. 13. Peter Davis Special to the Pahrump Valley Times Senior Jeremy Albertson (220 pounds) works over his opponent and gets a pin. 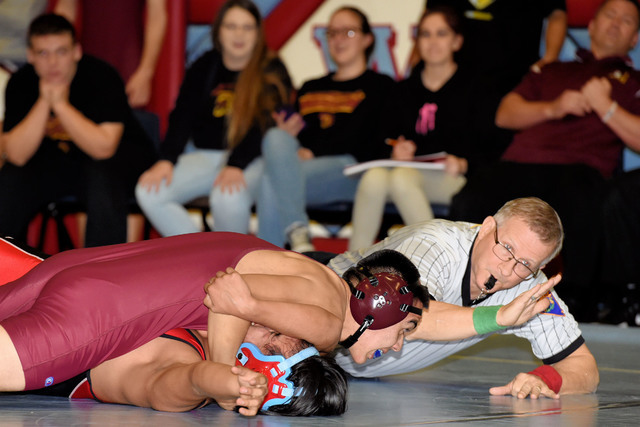 Peter Davis / Special to the Pahrump Valley Times Senior Garrett Monje (170 pounds) pins his Western opponent on Dec. 13. The reasoning for this wish was that right after break the Trojans wrestle against Cheyenne on Jan. 4, and Mojave on Jan. 10 at home. Rieger believes these teams are two of the toughest in the league and will test his team’s skill level. Rieger is not too worried about the Sunset League this year and believes his team should do well against the other teams in his conference. This year’s Trojans team are on the young side, but Rieger has a lot of good quality wrestlers still. “It seems like they are young every year because when they make the decision as a senior not to wrestle,” the coach said. But the wrestlers that do come out are great athletes. “And the thing about our team is when they are here they do everything we ask and they work really hard,” Rieger said. For Rieger, who is in his 23rd year of wrestling, he says he is having a hard time with this generation. He does not see the work ethic in the sport anymore. He said he has talked to other wrestling coaches this year and it’s not just in Pahrump but a conference-wide thing. Boys are just not coming out for wrestling anymore. He says his team is young for the past couple of years because the kids try the sport, come out for a couple of years and then quit. Some may even only come out for one season. Most wrestlers who stick with it for three years will quit on him their senior year. Case in point, the Trojans have only two seniors this year wrestling varsity, Garrett Monje and Brian Palmer. He said the class of 2014 was special. “The 2014 class was a good group of boys and was an exception because they made a decision as a class to come back and wrestle,” Rieger said. The coach said if you blink in January, you can miss the rest of the season. The JVs only have three weeks and they are done. The season is done by the second week in February. If you have never been to a Trojans home wrestling meet, this year you will have three chances to see the Trojans in January. The first will be the Mojave Dual mentioned earlier, and the last match will be against Desert Pines on Jan. 25 at 5 p.m. The Trojans put on a great show with music, and of course a great announcer in Joe Clayton. The house is usually packed with a screaming fan base.